“I believe that industry and the environment can be very good friends,” says Monica Del Aguila. She has worked in the health, safety and environmental sector of the oil and mining industry for 10 years since completing her bachelor’s degree in forestry engineering in Peru. Over the years she developed a keen interest in sustainability and the environment. “I want to help bring together the world of industry and the world of environmental protection,” she says. Completing Dal’s MREM program this spring is Monica’s first step toward making this happen. She first considered programs in New Brunswick and Newfoundland, but the MREM program presented itself as “the perfect diploma.” She remembers reading the course descriptions and getting excited about the deep environmental knowledge she stood to gain. “What really made me decide to do it was the internship,” says Monica. “I wanted to experience how it works in other countries, what their rules and regulations are, so that I can learn and bring it back to my country.” She says regulations regarding recycling and sustainability in Peru need to improve and she wants to help with that. Early in the program, she knew she had made the right choice. “They have a whole class in the first semester where they talk about the internship and help you with your résumé. They introduce you to people. As an international student, I didn’t know anyone here, so it really helped,” she says. 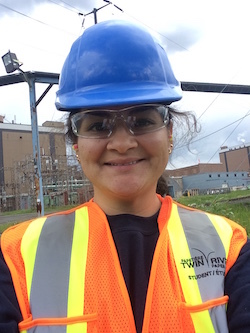 Monica spent her internship at Twin Rivers Paper Company in New Brunswick. “It was a really good experience. I learned a lot and the people were great,” she says. She admired the company’s re-use processes and its ability to generate so much of its own energy. While she speaks highly of her experience at Dal, she admits it was no easy feat. “The program is good but it’s hard. You have to do a lot of writing,” she says. “I’m not good at writing and, of course, even worse in another language.” At the suggestion of one of her instructors, she started going to the Writing Centre—a lot—and it helped. “By the next semester I knew what they wanted and how they wanted it. I really improved,” she says. In fact, Monica’s writing improved so much that you can now find her name on two published works, including a chapter in World Seas: An Environmental Evaluation, which is a collaboration with her classmates, as well as a paper in Environment International which she co-wrote with a professor. "Environmental impact assessment is about people"